"Aeronautical engineering" and "Astronautical engineering" redirect here. 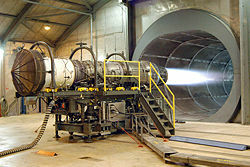 A Pratt & Whitney F100 turbofan engine for the F-15 Eagle and the F-16 Falcon is tested at Robins Air Force Base, Georgia, USA. The tunnel behind the engine muffles noise and allows exhaust to escape. Aerospace engineering is the branch of engineering that deals with the science, design, and construction of aircraft and spacecraft. There are two major branches of aerospace engineering: aeronautical engineering and astronautical engineering. The former deals with craft that stay within Earth's atmosphere, and the latter deals with craft that operate outside the atmosphere. Although the original term was "aeronautical," it has been superseded by the broader term "aerospace," because flight technology has advanced to include craft operating in outer space. On an informal level, aerospace engineering is often called "rocket science" and is represented as a pinnacle of engineering achievement. 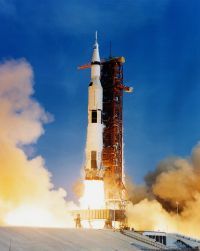 Apollo 11 lifts off on its mission to land a man on the Moon. The first definition of aerospace engineering appeared in February 1958. This definition considered the Earth's atmosphere and outer space as a single realm, thereby encompassing both aircraft (aero) and spacecraft (space) under the newly coined word, aerospace. Modern flight vehicles undergo severe conditions such as differences in atmospheric pressure and temperature, or heavy structural load applied upon vehicle components. Consequently, they are usually the products of various technologies including aerodynamics, avionics, materials science, and propulsion. These technologies are collectively known as aerospace engineering. Because of the complexity of the field, aerospace engineering is conducted by a team of engineers, each specializing in a particular branch of science. The development and manufacturing of a flight vehicle demands careful balance and compromise between abilities, performance, available technology, and costs. The navigable balloon created by Giffard in 1852. 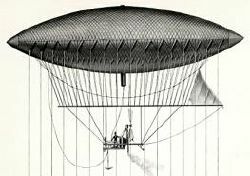 The 1884 La France was the first fully controllable airship. The first controlled hang glider flight was demonstrated by Abbas Ibn Firnas in al-Andalus in the ninth century. In the fifteenth century, Leonardo da Vinci's expressed his dream of flight in several designs, but he did not attempt to demonstrate flight. In 1783, Jean-François Pilâtre de Rozier and François Laurent d'Arlandes flew 5 miles (8 km) over Paris in a hot air balloon invented by the Montgolfier brothers. The balloon was powered by a wood fire and was not steerable; that is, it flew wherever the wind took it. Thereafter, ballooning became a "rage" in Europe in the late eighteenth century, providing the first detailed understanding of the relationship between altitude and the atmosphere. During the closing years of the eighteenth century, Englishman Sir George Cayley started the first rigorous study of the physics of flight. In 1799, he exhibited a plan for a glider, and he flew it as a model in 1804. Over the next five decades, Cayley worked on and off on the problem, during which he discovered most of basic aerodynamics and introduced such terms as lift and drag. He used both internal and external combustion engines, fueled by gunpowder, but it was left to Alphonse Penaud to make powering models simple, with rubber power. Later, Cayley turned his research to building a full-scale version of his design, first flying it unmanned in 1849, and in 1853, his coachman made a short flight at Brompton, near Scarborough in Yorkshire. Work on developing a steerable (or dirigible) balloon (now called an airship) continued sporadically throughout the 1800s. An important pioneer was Alberto Santos-Dumont (1873-1932), who designed, built, and flew the first practical dirigible balloons. In so doing, he became the first to demonstrate that routine, controlled flight was possible. In addition, he made the first public European flight of an airplane in Paris on October 23, 1906. That aircraft, designated 14-bis or Oiseau de proie (French for "bird of prey"), is considered by Santos-Dumont supporters to be the first to take off, fly, and land without the use of catapults, high winds, launch rails, or other external assistance. Non-steerable balloons were employed during the American Civil War by the Union Army Balloon Corps. The first powered, controlled, sustained lighter-than-air flight is believed to have taken place in 1852, when Henri Giffard flew 15 miles (24 km) in France with a steam-engine-driven craft. Another advance was made in 1884, when the first fully controllable free-flight was made in a French Army electric-powered airship, La France, by Charles Renard and Arthur Krebs. 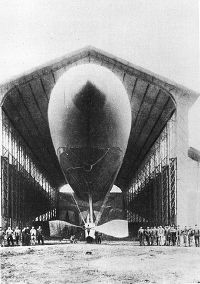 The 170-foot (52-meter) long, 66,000-cubic-foot (1,900-cubic-meter) airship covered 8 km (5 miles) in 23 minutes with the aid of an 8.5-horsepower electric motor. These aircraft were generally short-lived and extremely frail. Airships were used in both World War I and II, and continue on a limited basis to this day. Orville and Wilbur Wright flew the Wright Flyer I, the first airplane, on December 17, 1903 at Kitty Hawk, North Carolina. Early knowledge of aeronautical engineering was largely empirical, with some concepts and skills imported from other branches of engineering. Scientists understood some key aspects of aerospace engineering, such as fluid dynamics, as early as the eighteenth century. Only a decade after the successful flights by the Wright brothers, the 1910s saw the development of aeronautical engineering through the design of World War I military aircraft. The use of airships was largely overshadowed by heavier-than-air craft, which were developed after the advent of the internal combustion engine. De Havilland Comet, the world's first jet airliner. As in this picture, it was also used in service of the Royal Air Force. 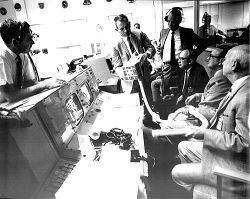 NASA engineers, like the ones depicted in the film Apollo 13, worked diligently to save the lives of the astronauts on the mission. After World War II, commercial aviation grew rapidly, using mostly ex-military aircraft to transport people and cargo. This growth was accelerated by the glut of heavy and super-heavy bomber airframes like the B-29 and Lancaster that could be converted into commercial aircraft. The DC-3 also made for easier and longer commercial flights. In October 1947, Chuck Yeager took the rocket-powered Bell X-1 past the speed of sound. Although anecdotal evidence exists that some fighter pilots may have done so while dive-bombing ground targets during the war, this was the first controlled, level flight to cross the sound barrier. Further barriers of distance fell in 1948 and 1952, with the first jet crossing of the Atlantic and the first nonstop flight to Australia. The first North American commercial jet airliner to fly was the Avro C102 Jetliner in September 1949, shortly after the British Comet. 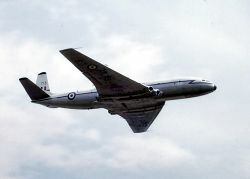 By 1952, the British state airline BOAC had introduced the De Havilland Comet into scheduled service. Although it was a technical achievement, the plane suffered a series of highly publicized failures, as the shape of the windows ed to cracks due to metal fatigue. The fatigue was caused by cycles of pressurization and depressurization of the cabin, and eventually led to catastrophic failure of the plane's fuselage. By the time the problems were overcome, other jet airliner designs had already taken to the skies. On September 15, 1956, the USSR's Aeroflot began operating regular jet services with the Tupolev Tu-104. The Boeing 707 established new levels of comfort, safety, and passenger expectations, ushering in the age of mass commercial air travel. When the Soviet Union developed long-range bombers that could deliver nuclear weapons to North America and Europe, Western countries responded with interceptor aircraft that could engage and destroy the bombers before they reached their destination. The "minister-of-everything" C.D. Howe in the Canadian government, was the key proponent of the Avro Arrow, designed as a high-speed interceptor, reputedly the fastest aircraft in its time. However, by 1955, most Western countries agreed that the interceptor age was replaced by guided missile age. The Avro Arrow project was canceled in 1959 under Prime Minister John Diefenbaker. In 1957, the USSR launched the world's first satellite, Sputnik 1, which triggered the space race with the United States. In 1958, the U.S. government founded the National Aeronautics and Space Administration (NASA), and U.S. aerospace engineers launched the first American satellite on January 31, 1958. In 1961, the sky was no longer the limit for manned flight, as Yuri Gagarin orbited once around the planet within 108 minutes, and then used the descent module of Vostok I to safely reenter the atmosphere, reducing speed from Mach 25 using friction and converting velocity into heat. This action further heated up the space race. The United States responded by launching Alan Shepard into space on a suborbital flight in a Mercury space capsule. With the launch of the Alouette I in 1963, Canada became the third country to send a satellite in space. NASA established the Apollo program, which ultimately led to the Apollo 11 landing of men on the Moon in 1969. In 1967, the X-15 set the air speed record for an aircraft at 4,534 mph (7,297 km/h) or Mach 6.1 (7,297 km/h). Aside from vehicles designed to fly in outer space, this record still stands as the air speed record for powered flight. The same year that Neil Armstrong and Buzz Aldrin set foot on the moon, 1969, Boeing unveiled the Boeing 747. This plane is still one of the largest aircraft ever to fly, and carries millions of passengers each year. In 1975, Aeroflot started regular service on Tu-144—the first supersonic passenger plane. In 1976, British Airways began supersonic service across the Atlantic, with the Concorde. A few years earlier, the SR-71 Blackbird had set the record for crossing the Atlantic in under 2 hours, and the Concorde followed in its footsteps. In 1981, the Space Shuttle made its first orbital flight, proving that a large rocket ship can take off into space, provide a pressurized life support system for several days, reenter the atmosphere at orbital speed, precision glide to a runway, and land like a plane. Fluid mechanics—the study of fluid flow around objects. Specifically aerodynamics concerning the flow of air over bodies such as wings or through objects such as wind tunnels (see also lift and aeronautics). Astrodynamics—the study of orbital mechanics including prediction of orbital elements when given a select few variables. While few schools in the United States teach this at the undergraduate level, several have graduate programs covering this topic (usually in conjunction with the Physics department of said college or university). Statics and Dynamics (engineering mechanics)—the study of movement, forces, moments in mechanical systems. Mathematics—aerospace engineering heavily involves mathematics. Electrotechnology—the study of electronics within engineering. Propulsion—the energy to move a vehicle through the air (or in outer space) is provided by internal combustion engines, jet engines and turbomachinery, or rockets (see also propeller and spacecraft propulsion). A more recent addition to this module is electric propulsion. Control engineering—the study of mathematical modeling of the dynamic behavior of systems and designing them, usually using feedback signals, so that their dynamic behavior is desirable (stable, without large excursions, with minimum error). This applies to the dynamic behavior of aircraft, spacecraft, propulsion systems, and subsystems that exist on aerospace vehicles. Aircraft structures—design of the physical configuration of the craft to withstand the forces encountered during flight. Aerospace engineering aims to keep structures lightweight. Materials science—related to structures, aerospace engineering also studies the materials of which the aerospace structures are to be built. New materials with very specific properties are invented, or existing ones are modified to improve their performance. Solid mechanics—closely related to material science is solid mechanics which deals with stress and strain analysis of the components of the vehicle. Nowadays there are several Finite Element programs such as MSC Patran/Nastran which aid engineers in the analytical process. Aeroelasticity—the interaction of aerodynamic forces and structural flexibility, potentially causing flutter, divergence, etc. Avionics—the design and programming of computer systems on board an aircraft or spacecraft and the simulation of systems. Risk and reliability - the study of risk and reliability assessment techniques and the mathematics involved in the quantitative methods. Noise control—the study of the mechanics of sound transfer. Flight test—designing and executing flight test programs in order to gather and analyze performance and handling qualities data in order to determine if an aircraft meets its design and performance goals and certification requirements. The basis of most of these components lies in theoretical mathematics, such as fluid dynamics for aerodynamics or the equations of motion for flight dynamics. In addition, there is a large, empirical component. Historically, this empirical component was derived from the testing of scale models and prototypes, either in wind tunnels or in the free atmosphere. More recently, advances in computing have enabled the use of computational fluid dynamics to simulate the behavior of fluid, reducing time and expense spent on wind-tunnel testing. Additionally, aerospace engineering addresses the integration of all components that constitute an aerospace vehicle (subsystems including power, communications, thermal control, life support, and so forth) and its life cycle (design, temperature, pressure, radiation, velocity, life time). Aerospace engineering can be studied at the advanced diploma, bachelor's, master's, and Ph.D. levels in aerospace or aeronautical engineering departments at many universities, and in mechanical engineering departments at others. A few departments offer degrees in space-focused astronautical engineering. ↑ Kaydon Al Stanzione, "Engineering," Encyclopædia Britannica 15th ed. 18: 563. ↑ Princeton Review, Aerospace Engineer. Retrieved February 17, 2009. ↑ Kermit E. Van Every, "Aeronautical engineering," Encyclopedia Americana vol. 1. Grolier Incorporated. ↑ NASA, A Brief History of NASA. Retrieved February 17, 2009. ↑ Open-Site, Engineering: Aerospace. Open-Site. Retrieved February 17, 2009. Brown, Charles D. 2003. Elements of Spacecraft Design. Reston, VA: American Institute of Aeronautics and Astronautics, Inc. ISBN 1563475243. Curtis, Howard. 2004. Orbital Mechanics: For Engineering Students. Atlanta, GA: Butterworth-Heinemann. ISBN 0750661690. Davies, Mark. 2003. The Standard Handbook for Aeronautical and Astronautical Engineers. McGraw-Hill Standard Handbooks. New York: McGraw-Hill. ISBN 0071362290. Newman, Dava. 2001. Interactive Aerospace Engineering and Design. Dubuque, IA: McGraw-Hill. ISBN 0072348208. Raymer, Daniel P. 2006. Aircraft Design: A Conceptual Approach, 4th ed. AIAA Education Series. Reston, VA: American Institute of Aeronautics and Astronautics. ISBN 978-1563478291. Sidi, Marcel J. 2000. Spacecraft Dynamics and Control: A Practical Engineering Approach. Cambridge, UK: Cambridge University Press. ISBN 0521787807. This page was last modified on 3 February 2019, at 16:48.